Proclamation, Font 7c+ (Photo taken in the old irish tradition of lonely Hebridean first ascents; by self-timer, moments after the actual ascent). Going right from here along the rail instead of up will be at least Font 8a. I had the pleasure of taking the Calmac ferry to Harris today for a week of discovering new places to climb, on foot and tomorrow, by boat. After tea in Hotel Hebrides (much recommended) new cafe in Tarbert, I had two hours to climb some rocks. 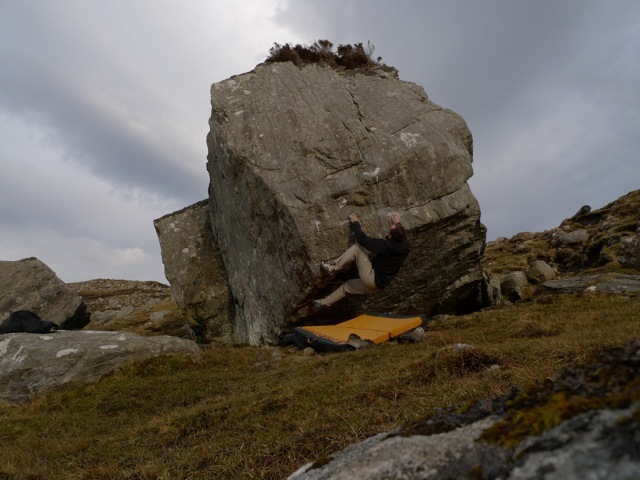 Niggling in my mind since my last two trips to Harris was a wee boulder problem on Clisham that had eluded me on both sessions. It had looked as though there was one way, and one way only to climb the thing. As it was a bald, rounded prow of gneiss I was foolish enough to fall for that. Of course it took me to accept that I was about to fail a third time to start using my imagination. Fifteen minutes later, I’d figured out that climbing most of it with at least one foot above my head might actually work. I had three minutes left before I had to leave for evening meetings with colleagues on our project. So I did it. It was the first time in a while I surprised myself rock climbing and felt elated on the top of a boulder. The reason for this is a renewed hunger for the direct, hands-on grapple with rock texture, as opposed to the winter of being disconnected from the medium by the length of a pair of ice axes all winter long. The Gneiss does a better job of indulging the appreciation of rock and movement aesthetics, and the great feeling of friction underneath the fingers than any rock I can think of. About fifteen inquisitive sheep witnessed my ascent. A few interrupted their continuous chewing motion to make proud proclamations into the evening haze in the glen.